Most investors consider superannuation for long term tax-effective savings and despite all the changes over the years, maximising the superannuation rules is paramount in all client’s retirement plans. this area and have placed limits on wealth creation and estate planning in superannuation. Investors who have made maximum contributions to super, or are over the cap are beginning to build additional wealth by investing in insurance bonds or company structures. Company structures and investment bonds tax income at a maximum tax rate of 30% (currently). However, investment bonds have some unique features that in certain circumstances may give them an edge over company structures. Company structures may suit high net wealth clients who are happy to set up a private company to hold investments. But this may only be a tax deferral mechanism, as eventually funds may need to be paid out of the company and personal tax becomes payable at the investor’s marginal tax rate, less any franking credits (if an Australian tax resident). Investment bonds offer an alternative long-term strategy given that personal tax relief becomes permanent after 10 years. Let’s take a closer look at how these two alternatives outside of superannuation compare and the benefits of each option. Generally, individuals on higher marginal tax rates may seek tax-effective investments that achieve long term wealth creation over and above their superannuation, which is now limited by policy-driven contribution caps. As an investment vehicle for tax-effective wealth creation, Investment Bonds are an alternative option to a Company Structure. However, from a tax strategy point of view, there is a fundamental difference between these two options. *Assuming the 125% rule on deposits is not broken and withdrawals are not made within the first 10 years. Company structures are usually a tax deferral mechanism, therefore are not a tax effective solution if they do not actually reduce the eventual tax. In the case of a private company, company profits can also be transferred to an individual as salary/wages, director’s fees, or interest on any loans advanced to the company, etc. Such transferred amounts can be expected to be included in the investor’s assessable income. Any distributed company profits are taxed at the investor’s marginal tax rate, less any franking credits. Any tax offset for franking credits merely compensates for taxed company profits – so the value of franking credits should be regarded as merely avoiding double-taxation. Tax is only reduced (on distributed company profits) if the investor’s marginal tax rate is lower in the tax year of withdrawal, than in previous years. Conversely, tax can be increased if the opposite were true. Also, tax is only reduced (on distributed company profits to an Australian tax resident) if the investor’s marginal tax rate is lower than the company tax rate. Again, conversely, tax can be increased if the opposite were true. Lower tax can also be achieved, if the investor’s share interest is sold for a capital gain (after holding that interest for at least 1 year) and if 50% of the ‘discounted capital gain’ became exempt from tax. However, unless no other income amounts were drawn from the company, any discounted capital gains tax would be additional to full tax at marginal rates on such other income drawn from the company – including dividends and undiscounted capital gains. Note: Use of a private company structure also needs to recognise the tax pitfalls of Division 7A of the Income Tax Assessment Act 1936. Division 7A may apply to a private company that makes tax-free distributions to its shareholders or their associates in the form of payments, loans or debts forgiven. Tip: Investing money via a company structure may only defer tax payable. The earnings are still taxable at the investor’s marginal tax rate upon withdrawal. Tax is only reduced if the investor’s marginal rate has fallen at that point. During the period of investment, ongoing earnings are taxed within the bond, currently at 30%. They are not included as income of the investor and therefore do not increase the investor’s taxable income, or attract (or increase) the investor’s marginal tax rate. Thus, tax on investment earnings can be permanently capped at 30%, and never attract personal tax (or Medicare levy). Only the net after-tax income received from the investment is taxable and is paid by Centuria from earnings of the 7 8 Autumn 2018 Portfolio, not by the investor. So, there is no notional grossup of assessable income for the investor here (unlike a franked dividend on a company share investment). A nominated beneficiary (who receives fund proceeds if the investor has died) will not be taxed. As a long term strategy for tax-effective wealth creation, an investment bond may be an appropriate vehicle given there could be no personal tax obligations on reporting and payment by the investor. Tip: Investment bonds offer a tax-effective savings solution for middle to high income earners, especially if funds remain invested for at least 10 years. A real tax saving occurs if the investor’s marginal tax rate is greater than the bond tax rate (of 30%) – as is the case with most working Australians on marginal tax rates of 34.5%, 39% and 49%. This can also apply to minors, who attract high tax rates (between 45% and 66%) on Division 6AA income above the small $416 tax-free threshold. 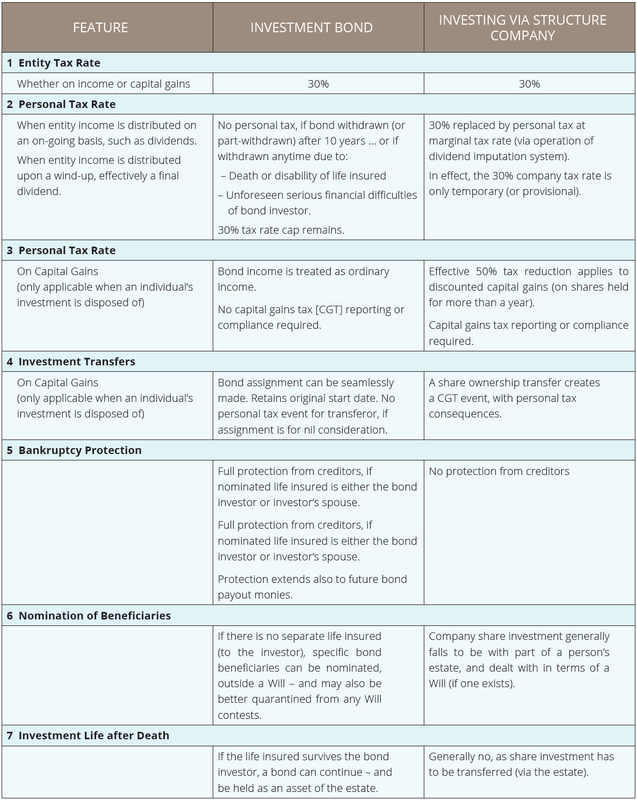 Investment bonds can also provide a tax advantage when compared to a company structure as the bond tax offset (unlike imputation credits from franked dividends paid by a company) is not part of the gross-up tax rules – and required to be included in the investor’s taxable income.